Every decision in life that has a consequence. Adopting a pet provides companionship and messy clean up. Getting married involves loving commitment and quirks to work around. Having children brings joy, challenges and lack of sleep. Buying a home has a sense of independence, a way to showcase your personality and style as well as maintenance that requires professional guidance and execution. Whether our decisions have a positive, negative or balanced impact depends on our values. What is your primary decision factor? There are only three. Budget, Timing and Quality. Do you shop at discount stores knowing that you are keeping your budget low and might have the opportunity to grab a quality designer item, but knowing that it will take a while to search through the un-organized racks? Do you shop at department stores, confident that you can find what you are looking for off the rack in a reasonable amount of time and knowing that you might pay a little more for something that will most likely have a shorter lifespan? Do you shop at designer boutiques because you will be certain of the quality of the item as well as the design, knowing that you will pay more for the item that took longer to produce as well as find the just right fit for you? Asking yourself these questions will give you a sense of your general decision making style. In remodeling I often come across home owners who have chosen one of these routes. Most often is the person who has chosen the lowest budget route and unconsciously sacrifices both timing and quality. It is like your basic three-legged-stool. When emphasis is too heavily placed on one leg, the others loose their ability to be maintained and the remodeling nightmare begins. It pains me to see friends in this predicament even now. Remodeling decisions require balance. Be realistic, how long will it take to remodel my home, 4 weeks or 6 months? Where do I live, what is the cost of living like? Why am I remodeling, for my long-term living, a fast sell on my home? Unfortunately home improvement shows are generally unrealistic for bay-area living. Their budgets are usually materials only and/or are based on national averages. As you know, living in the San Francisco bay area, we are at the top of the national averages in cost of living thus increasing the wages needed to pay for quality professionals. To ensure that the professionals you hire can provide quality we all desire it may take a little longer than just a few weeks. 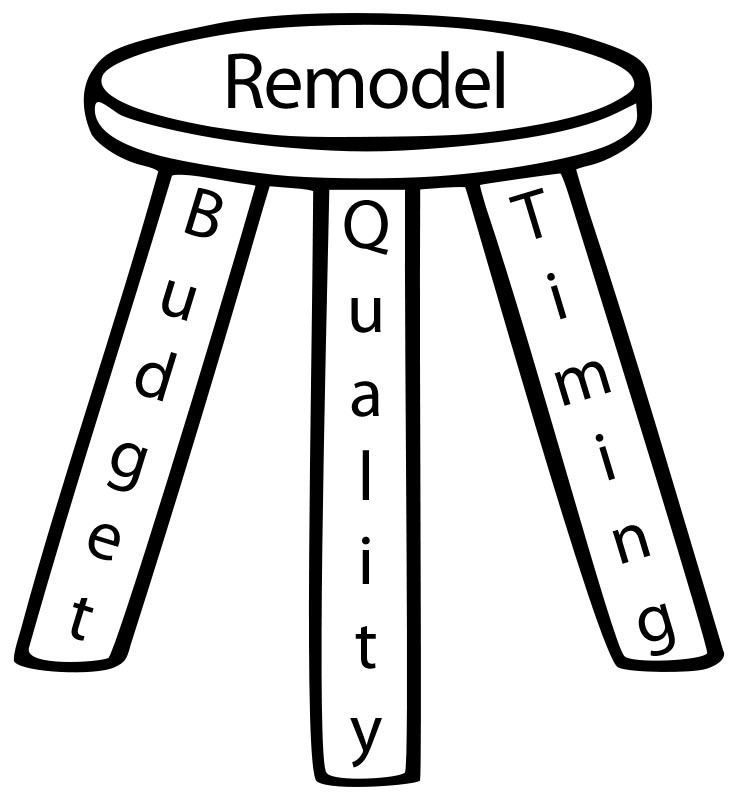 While timing and budget vary from project to project, quality should not. Does this mean you must select the highest rate? No, but it does mean that the lowest rates should be off your radar. Does this mean that you should have a 6 month time estimate for construction of a small bathroom? No, but it does mean that you should carefully consider time-frames of 2 weeks or less. In everything, ask yourself "is it too be god to be true? ", if you think it just might be, I recommend using your gut instinct. A quality remodeling professional will communicate clear intent and execution plans, communicate changes in a timely manner, put you at ease in discussing their home, your budget and timing, have a realistic schedule for your project, be known in a positive light by their peers, local showrooms and clients. Most of all, in selecting a professional for your home there must be trust. You are inviting people into your life more than you realize. As a designer I'm ok with seeing your messy home even on our first appointment, it shown me how I might be able to restructure your storage needs. You will see the general contractor and their trade partners on a daily basis during construction from breakfast till dinner. Although it is said that the three-legged stool always has one leg favored, I encourage you to have balance between the three as much as possible so that the consequence of remodeling is as pain-free as possible and provides you with the beautiful home you imagined.